This project was to build an extension off the back screened in patio. We chose stepping stones to build the platform for the patio extension. 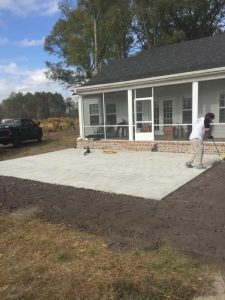 These are similar to building a patio extension with pavers, but the stepping stones are larger. Of course one can try to build these on their own, often when we go into a homeowners house and they have tried to do such a large job, they have missed some of the impotant steps we know is important. While creating, we used a different technique that we’ve never used before and it turned out really good and stable. You could use an extension like this for gatherings, kids play area, add a move around fire pit and enjoy the cool winter nights, and so much more. This is a great alternative to building a deck. It’s a great way to have an outside bbq area. With a patio this size, your imagination is the limit. No matter the time of year, a patio like this can be enjoyed. Need other home improvements? Call on us today!